The Personal Injury Lawyer market in Ontario has become very competitive in recent years. Several firms are attempting to increase their market share by introducing province-wide mass marketing campaigns, and by opening "remote offices" in every corner of the province. 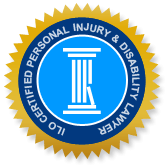 The Injury Lawyers of Ontario were formed in an effort to spread the word to Ontarians that there are world-class personal injury lawyers located right in your own community. If you or a family member has suffered a serious personal injury please allow one of our local lawyers to discuss your case with you. We are confident that their hometown touch will help you achieve the optimal outcome to your unfortunate situation.